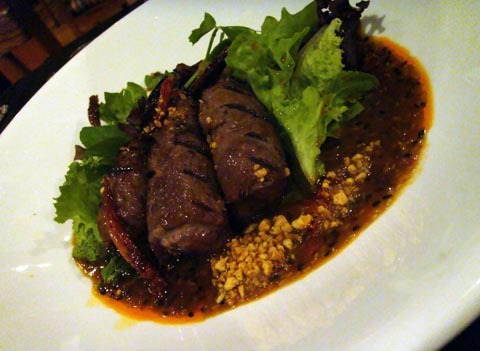 Kha is a modern Thai restaurant located in Hort Park. The setting is quite interesting, although I would only recommend the outdoor tables on next to the main entrance. Apologies for the pathetic pictures, but this was a dinner and the ambient light was so dim that producing appetising photos would have been a real challenge. 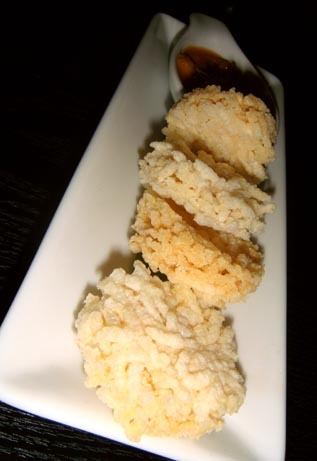 We were served a complimentary starter of rice crackers with a curry sauce for dipping. 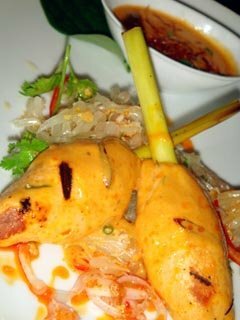 As a starter, we chose 'hor muk salmon', described as spicy grilled salmon souffle on lemongrass with pomelo salad and red curry dressing. Although the description sounded quite 'modern', the dish tasted quite authentically Thai. The salmon souffle' was actually a typical salmon fishcake accompanied by a nice foamy sauce. The second starter was a salad called 'yam nua wagyu' and described as rare grilled red curry rubbed Wagyu beef, papaya salad, yogurt and chili jam. This also tasted quite typically That, with the exception of the Wagyu beef that didn't taste like Wagyu at all. The beef was of average quality and it was nothing like Wagyu beef and didn't look it either. If you forget about the 'Wagyu' bit, then you can probably start appreciating this dish. 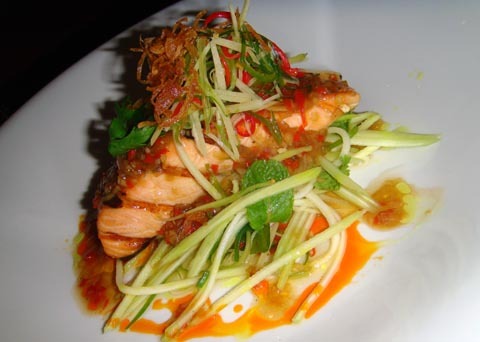 The 'pla salmon yang', a grilled salmon fillet served on green mango, ginger, Thai herb salad with citrus oyster sauce dressing was an enticing combination, but a rather disappointing find. On the positive side, the salmon was only lightly seared. Being a sashimi appreciator as I am I can only be pleasantly surprised by that, but I can also imagine lots of un-entertained faces biting into what they expect to be a cooked salmon fillet to actually feel a thick chunk of raw meat as they start chewing. Writing 'seared' on the description might help. There was nothing wrong with the way the dish was cooked, but it just didn't work. Perhaps a different fish would have made this a successful combination, but salmon really didn't work with that set of ingredients. Finally we had the 'nua moun' - a beef tenderloin wrapped around enoki mushrooms with seasonal vegetables, spicy sour tomato puree' and green leaves. 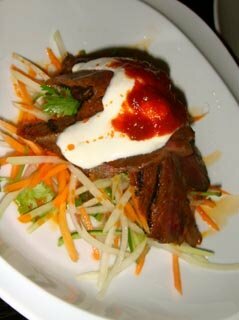 This dish was OK, the beef being not particularly tender, but well marinated into its Thai tasting sauce. The dessert selection was not incredibly inviting as in any Thai restaurants. 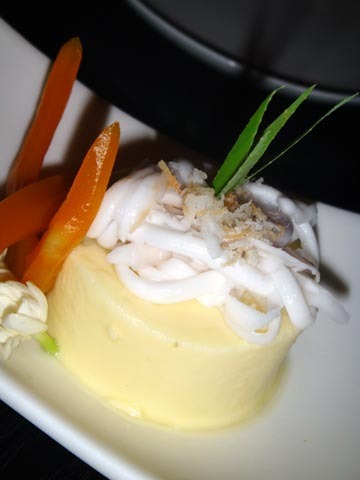 I had the 'sung kaya fuk thong', a coconut mousse with poached pumpkin in jasmine syrup. I wasn't particularly impressed by what was actually not a mousse but a coconut pannacotta topped with coconut meat and garnished with caramelised strips of pumpkin. 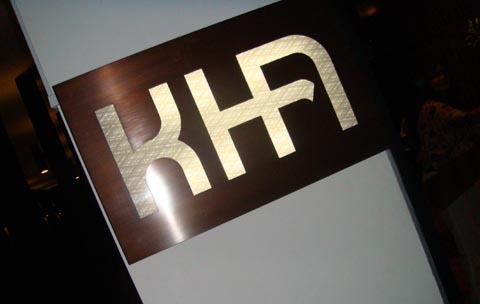 Overall, I was highly unimpressed by Kha for a number of reasons. Starting from the environment, which looked pretty impressive on picture, while in reality it didn't meet my expectations. The outdoor terrace at the back where I was first seated was very noisy and right next to the roadside, so I asked to be moved inside. The service was rather poor for a restaurant at this price range. There was a continuous storming of waiters coming in and out of the restaurant to serve the outdoor tables. The fact that a couple of waiters kept rushing through the door to suddenly come to a halt only 1 meter next to our table and stand right there in order to take their order using their portable palmtop became rather disturbing after a while, to the extent that I had to communicate it to the manager. After my complaint, the waiters were redirected to the counter in order to complete their orders. My guess is that their palmtops have a very short reception and the waiters are unable to use them outside, so they have to rush into the restaurant and stop as soon as they get reception. Not very well thought, and they'd better sort it out fast considering that they will be losing customers because of this. The fact that the dishes weren't accurately described in order to make them sound 'fine dining': a salmon mousse that is actually a fishcake, a coconut mousse that is a pannacotta, a salmon steak that is a raw seared chunk of salmon, a 'Wagyu' beef that is a normal slice of beef. The restaurant is overpriced and it does not deliver the right level of ambiance, service and food to justify the bill.